Silver miners plummeted in August, but it could represent a lustrous buying opportunity. It's been a tremendous year for investors in silver-mining stocks, but the month of August provided the first real blemish of the year. The Global X Silver Miners ETF, which is up 140% year-to-date through Sept. 1, 2016, wound up losing 15% of its value during the month of August, which came on the heels of physical silver losing about 10% of its value. Then again, it's important to keep things in perspective. 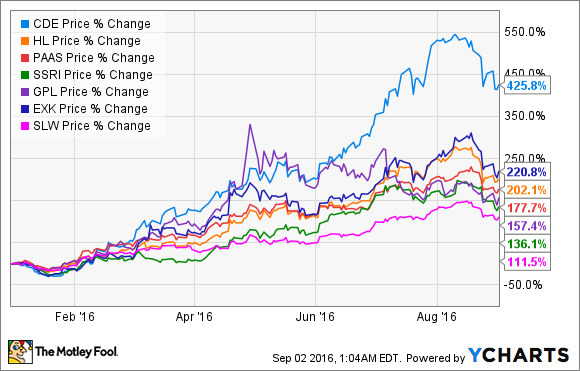 Even with these dismal August performances, silver stocks are still among the markets' top performers in 2016, as you can see below. Why did silver stocks tumble during August? The answer can likely be traced to two catalysts. By far the more important of the two would be the considerably better economic data that's been trickling out in the United States. In July, for example, the U.S. created 255,000 jobs, which was 75,000 better than economists had expected. It firmly put May's anomalous jobs report in the rearview mirror. Additionally, the July Purchasing Managers Index hit 52.6, which was slightly lower than June, but still signals economic expansion in the manufacturing sector. Wall Street took the jobs and ISM report from July as more confirmation that the U.S. economy is healthier than most investors realize. This economic data is important because it's what could influence the Federal Reserve to raise interest rates. The Fed had been primed to boost lending rates about four times in 2016, but weaker U.S. GDP growth, and more recently Britain's decision to leave the European Union (known as Brexit), stymied that plan. Even sans inflation, with economic data suggestive of expansion, the Fed could choose to raise interest rates another 25 basis points in September. Interest rate increases are typically bad news for physical silver and silver miners. First, miners tend to borrow money in order to develop new mines or expand existing mines. This means new borrowing costs could be higher, thus eating into their margins. In terms of physical silver, it all comes down to opportunity costs. Investors buy silver (or its partner, gold) when the cost of foregoing the near-guaranteed income associated with interest-based assets like CDs or bonds, is relatively low. If interest rates rise, and the yields on CDs and bonds begin to rise, we could see investors trading out of physical silver and into interest-based assets with improved yields. That could hurt silver miners' margins. The other concern would simply be that silver is a more thinly traded metal than gold, and is therefore a bit more prone to overreactions. Though silver and gold tend to move in the same direction, silver usually overshoots its partner metal to the downside, and overshoots gold to the upside. With gold dropping nearly 5% in August, it's not too shocking that silver's dip was twice as steep. However, I would hardly call August's swoon a reason to run for the exit. Instead, it looked like the perfect buying opportunity for value investors to consider dipping their toes into the water. From the perspective of the physical metal, silver is unlikely, in my opinion, to see considerable downside. Even if the Fed were to raise interest rates by a quarter of a percentage point, CD and bond rates would still be unattractive relative to the inflation rate. There's still little reason for investors to be excited about fixed-income assets, meaning silver should remain very much on investors' radars. More importantly, silver miners have made sizable advancements in terms of lowering their all-in sustaining costs (AISC) and reinvesting their capital in only their most profitable ventures. Of the seven silver miners listed above, most look to be primed for long-term success – and many could well be considered value stocks. The big theme among silver miners in recent years has been cost-cutting, which primarily has been achieved by lowered capital expenditures and smarter exploratory spending. This isn't to say some miners aren't actively looking to boost production (we'll get to that in a moment), but cost-cutting has been a critical cog to regaining profitability for silver miners. For example, Endeavour Silver recently reported that its AISC fell 38% to $10.53 per silver ounce, which helped it flip a $1 million net loss into a $1.7 million profit in Q2 2016. Interestingly enough, Endeavour's silver production dipped 14% year-over-year, but its gold production, which acts as a byproduct that lowers its silver AISC, improved 17%. In other words, Endeavour is being smarter about how it mines, and the results show it. The story is the same for Pan America Silver and Great Panther Silver. Pan American Silver reported a 22% decrease in Q2 AISC to $11.31 per silver ounce and a 41% fall in consolidated cash costs. Despite a nearly 1% drop in revenue, Pan American Silver's operating cash flow tipped the scales at $66 million, its highest level since Q4 2012. Meanwhile, Great Panther announced a 74% drop in its Q2 cash costs and a 43% plunge in its AISC from the prior-year quarter. Though Great Panther does expect its costs to rise as it boosts its CapEx during the second-half of 2016, the reduced midpoint of its AISC guidance is still nearly $6 below the current price of physical silver, leaving the company with plenty of buffer. For other silver miners, acquisitions and/or expansion has been on their minds. Hecla Mining announced in May that it'd be acquiring Mines Management in an all-stock deal that, at the time, was a 41% premium to Mines Management's share price. The deal allows Hecla to get its hands on Mines Management's Montanore mine, which is expected to have an initial throughput of 12,500 tons per day, and be capable of producing more than 6 million ounces of silver, as well as 50 million pounds of copper, annually. Silver Standard Resources got in on the act as well with its acquisition of Claude Resources in order to get its hands on the Seabee mine. After years of producing around 50,000 ounces annually, Claude's expansion into the Santoy Gap, which was ahead of schedule, boosted its output by about 20,000 ounces annually. Ultimately, the acquisition of Claude Resources further diversifies Silver Standard's production portfolio and immediately adds to its EPS and cash flow. As a shareholder, I'm not complaining about Silver Standard's execution one iota. Coeur Mining has provided both production expansion as well as cost-cutting, setting it up as one of the top-performers within the industry. Production by silver equivalent ounces (SEO) rose 19% in Q2 to 9.6 million SEO thanks to a big ramp-up in tons milled at Palmajero and Rochester. Coeur specifically noted that its increased production at Palmajero in Mexico should be a significant cash flow growth driver moving forward. Finally, royalty company Silver Wheaton continues to forge deals that'll allow it to take advantage of silver's (and gold's) rising spot price. In exchange for upfront cash, Silver Wheaton forges long-term or life-of-mine contracts with miners for per-ounce prices that are far below the spot price. In Q2, Silver Wheaton took delivery of silver at an average cost of $4.46 an ounce and $401 per gold ounce. That's a buffer of roughly $14 per silver ounce and more than $900 per gold ounce based on current spot prices. With a number of silver miners trading at just a single-digit multiple of their 2017 cash flow, now could be the time to consider these stocks as potentially attractive buys.